Hi readers, In this post I m gonna tell you how to create A successful WordPress Blog from scratch. Step by step with no steps skipped.So lets Begin. 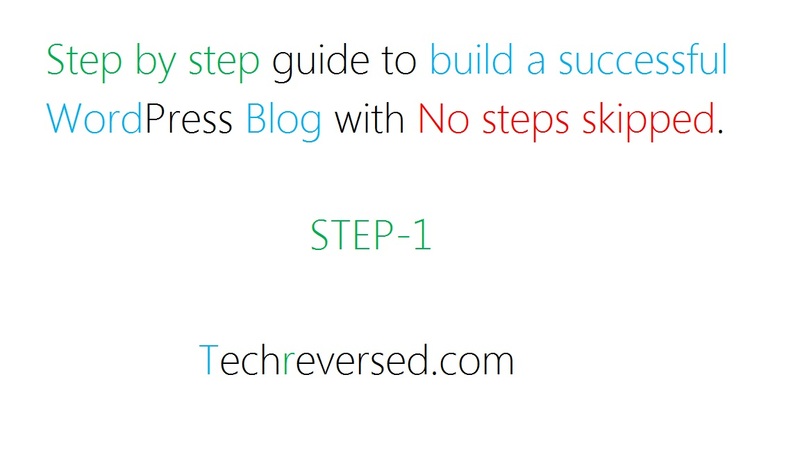 How to build a successful WordPress blog steps. 1st Choose appropriate Topic/theme of your blog. In order to build a successful WordPress blog. First you should choose the topic/niche of your blog in which you excel or have enough knowledge to share. A blog can be of various types tech blog, lifestyle blog etc. You should also be able to provide Unique and Quality content to the readers. You can predict your success by posting some of the content to the Guest Post of any website with similar content as yours. 2nd Create content before starting/buying a domain. In blogging industry Content Is King. If you have quality content users will come to you without any advertisement of your blog(though advertising is not bad for instant success and if you have money to spend). I suggested you to have some content handy before starting a domain so that you can compare your content’s quality and uniqueness with others and you can easily evaluate where you stand. If after evaluation you think your content writing skills are better or equivalent with top bloggers then you are good to go. 3rd Create Layout of your blog. Create a layout of your future WordPress blog. As Simple as with pen and paper which will help you better understand, edit, modify your future blog. For Exp. How you would Categorize your content, topics and where you will place those categories etc. If you are a tech enthusiast like me & wanna build a tech blog. You can check my Website layout for help. 4th Choose A Perfect Domain for your WordPress blog. A domain is one of the most important factor in blog’s success. I have seen people naming their domain with their names, I mean come on man how can you expect anyone to visit your domain. How to choose a perfect domain. A domain should reflect your blog’s theme/topic. For exp. If you wanna start a tech blog you can choose a domain like mytechblog.com or techgeek.com etc. Unique domains are great since there could only be your domain with those keywords. A domain should not be too long exp. www.mynewwebsitefortechnologynews.com or too short. exp. www.te.com. There are various tools to which will help you find your domain name. like Domains Bot. In the next step we will discuss how to get domain name, hosting and installing WordPress. Do tell us how to do you like this article by commenting below. Next story Xiaomi Unveils Mi Note Pro | Mi Note Pro Specs-Price-Pros.